To know me is to understand my devout, unconditional, and steadfast love for Chipotle Mexican Grill. While I get the EXACT same thing every time I go there (burrito bowl with rice, fajita veggies, tomatoes, cheese, and guacamole), everything that restaurant has to offer is delicious. Not only is the food life-changing, the staff and general manager at my local restaurant are fantastic. As you can imagine, the staff members recognize me by now and maybe it’s in my head, but I’m pretty sure I see them behind the glass window snickering as I walk in the door 2-3 times a week. I normally laugh as I get to the line and tell the person my order, knowing that it is the same as yesterday and will be the same tomorrow. It is my dream that one day they will see my car pull up in the lot; I will walk in the door and my burrito bowl will be waiting for me at the cash register. That is my most prevalent dream/goal for my life right now, and I’m okay with that. Someday Courtney, someday! Be patient! Riding back to the office, Jennifer, Cat, and I couldn’t believe what had just happened. For no reason whatsoever, this man had decided to give us 30 meals for free! Yes, I have probably spent close to a college tuition on burrito bowls in the past few months. Yes, it will be good business for the restaurant. Maybe he’s trying to get brownie points so he can get one of our phone numbers. No matter the reason, what an amazing gesture! A little while later it dawned on me that about a month ago I wrote to the corporate Chipotle office to tell them how excellent this particular branch is. Working in the food service industry for the past 9 years, I know how valuable compliments and praises from guests can be for an establishment. I told corporate how attentive and cheerful the staff is, even in the heat of the busiest lunch rush. I described how the manager is always out on the floor cleaning tables and making sure every guest in the restaurant is smiling. The representative from Chipotle wrote me back, along with about 20 executives attached to the email. He thanked me for the feedback and assured me the branch would be notified of their compliments! So while Al has never mentioned the email, maybe this is his way of repaying the favor. Maybe he never even saw the email, or didn’t realize I was the one who wrote it. Maybe he is just the type of man to randomly do kind things for people. Either way, karma is at work and I will be sure to pay forward this gift! We also LOVE our Chipotle. 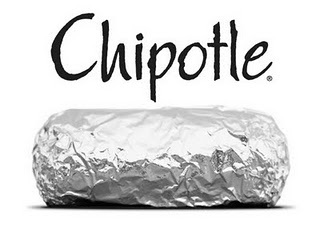 Lissy’s friends used to drive to WEST VIRGINIA to get Chipotle before they opened on in Durham! I LOVE that you contacted headquarters!